This is a sponsored conversation written by me on behalf of The J.M. Smucker Company. The opinions and text are all mine. 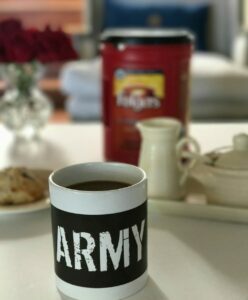 I’m partnering with Folgers® at Walmart through the Share A Cup & A Story campaign, to create personal connections with Veterans and honor their service to our country. People are always surprised when they hear that I served in the Army. I was so young – just a month out of high school. When I left home for basic training, it was my first time on an airplane. My paternal grandfather was a career Army officer. 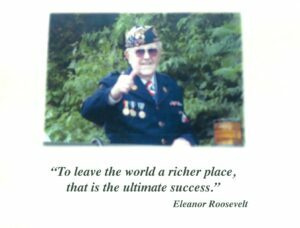 He served in both World War I and World War II. My dad was a World War II veteran who fought in the Battle of the Bulge and D-Day. Dad served the needs of veterans from the time he got home from the war until he died a few years ago. 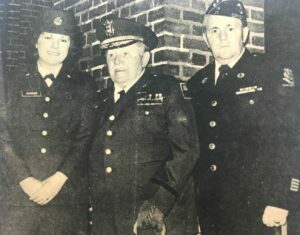 Everyone in my hometown affectionately called him “Uncle Sam.” He was a lifetime member of the American Legion and part of his devotion to veterans was to organize a Veterans Day and Memorial Day parade each year. Over the decades, the Memorial Day parade grew in popularity and it became the largest one in New England. Veterans Day and Memorial Day were dad’s special days. At the end of the parades, he would speak to the crowd and urge everyone to remember the sacrifices that our veterans, both past, and present have made and to teach our children that our freedom is not free. One of most vivid memories from my childhood is going with my dad to place flags on the graves of veterans. I had the audacity to complain that I was tired and hot. Looking back, that was a setup. Dad was looking for a tangible way to talk to me about the real hardships of serving your country and what soldiers endure on our behalf. I miss him so much but I’ve realized that my grief has kept me self-centered. Since his passing, it has been difficult for me to simply say “thank you for your service” when I see a veteran, let alone stop and chat with them. I get all choked up, and then I get embarrassed. Last year, I was at the Baltimore airport on a layover. As I waited at my gate, I could hear loud cheering getting closer and closer. An Honor Flight of World War II veterans had just arrived. They were on their way to see the WWII Memorial in Washington, D.C. The entire terminal was clapping and standing as they walked by. Many were in walkers or wheelchairs. I’ll never forget that moment. It was our greatest generation right in front of me. All I could do was clap and cry. When I look at this photo of me and one of these heroes, I can see the tears in my eyes. The lump in my throat was so big that I could barely speak. I knew in that moment that my dad would not have been satisfied with my lack of courage and that I needed to do better. When I was given the opportunity to participate in the Share A Cup & A Story campaign with Folgers® coffee and Walmart, I knew it was time to think of others and not of myself, in the way that I was taught. I’ve known my neighbor Paul for about 6 years. My husband Art is a Vietnam veteran and he and Paul have bonded over their mutual love for our country. Through their friendship, Art has shared some of Paul’s background with me. I know that my dad and Paul would have also been fast friends. In my mind’s eye, I can see them sharing stories and bonding over their common experiences. My fear of becoming too emotional and embarrassing myself has held me back from reaching out and getting to know my neighbor better. With Veterans Day approaching and my dad on my mind, it was time to fight that inner battle and do one of those hard things that I have been avoiding. I invited Paul over for a cup of Folgers Classic Roast. We share a fence and as it turns out, we also share some common experiences as veterans. Paul is 71 years young. You can see his military bearing in his posture, speech, and manners. Those traits have remained strong and steadfast. He is a decorated West Point graduate. I asked him about his military awards and he has 13 including the Legion of Merit. He served in Germany and Korea and several stateside posts during his 23 years of active service. I learned that his father was a B-17 pilot in the Army Air Force (AAF) during World War II and that five of his uncles also served. It was one of the commonalities we discovered. I also had five uncles and one aunt (a nurse), who also served in World War II. As a mother, I can only imagine the anguish of having your children serving in wartime with limited communication, praying and wondering if you will ever see them again. Sadly, one of Paul’s uncles served in the Korean War and was classified as killed in action with his remains unknown only three days before the truce was signed to end that war. Those stories should never be forgotten. Paul grew up on a small farm with no close neighbors or children. As a young boy, he remembers playing soldier by himself wearing his dad’s uniforms. He also remembers watching the Army/ Navy Academy football games with his dad. That made me smile — that is another fond memory we shared. Going to West Point was his dream from the time he was a young man. I wonder how many other dreams were shaped for future Navy Midshipmen and Army Cadets while watching the pageantry and camaraderie on display at those classic football games. As a commanding officer, he learned to set high standards both for himself and for those who served under him. He made a point to tell me that he treated his soldiers with respect and he led by example. Paul said he would study the characteristics of leaders, both good and bad. Imagining myself under his command, I’m speculating that he would have been tough but fair. His military training and discipline molded his character and has much to with his desire to continue to lead and instruct. Although he is retired, he advises aspiring high school West Point cadet candidates. He administers physical fitness tests they must pass in order to qualify as future military leaders. Paul said the cost of a West Point education surpasses a half million dollars so there is no doubt that the screening process is extremely rigorous. Before he visited, he took the time to write down his military history to help to jog his memory and then he put it in a special place at home so his children and grandchildren would have access to a written timeline of his military service. If you have an older veteran in your life, I encourage you to have them do the same. As Paul and I got more comfortable chatting, we talked about another common memory. Serving in the military often comes with extreme loneliness, feeling forgotten, and longing for home. Last year, I shared 20 ways to honor our veterans beyond Memorial Day and Veterans Day. Here are just a few ways to celebrate this Veterans Day in a meaningful way. Write a letter of thanks to a military family, those currently in the service or a veteran through Operation Gratitude or amillionthanks.org. Contact a nursing home or a veterans hospital. A visit can brighten a day and help a veteran to know they are not forgotten. The Walter Reed National Military Center has a Facebook page that provides inspiration and ideas. The Guardian Angels for Soldiers Pets arranges foster care for the pets of the military when they are deployed, during basic training or if they are unable to care for them. Contact them if you are able to provide a temporary home for a beloved pet. I’m feeling strengthened by the experience and the satisfaction that comes from doing the right thing. I’ve made a pledge to myself that I am going to honor my dad’s memory by connecting with the veterans that cross my path. I’m going to continue to overcome my reluctance to be embarrassed should that lump in my throat and tear in my eye emerge. I’m guessing that they will. I’ve learned that grief is a lifelong journey and that we all have stories to tell. 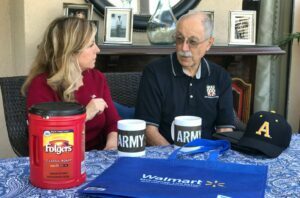 This year for Veterans Day, why not pick up some Folgers coffee at Walmart and invite a veteran to share a cup of coffee and a story with you. Listening to their stories is a small yet powerful way to extend a hand in friendship and to honor their service to our country. Do you know a veteran you’d like to learn more about? Wow, this is very heartfelt. My dad served in WWII, my uncles served in Korea, and two cousins served in Vietnam. They will love this article. Wow, Paul is a great man. I like the idea of writing down his military history so his family will always have it. That is a wonderful way to keep his memories alive. This post touched my heart. My son has been in the Navy for 5 years and my other son is on his way. So the military is still all new for me. Thank you Tara. I will keep your sons in my prayers. This is a great way to reach out to the local Military community and give back. I live near a base and have a lot of opportunities to help out. I really enjoyed your sharing your story. I think it is great that you could have that time with your grandfather and now with your neighbor Paul. I appreciate their service and yours for fighting for my rights to be free. I also love Folgers! Wow Paul! Thank you so much for sharing your story. These are all great ways to share a cup and a smile with someone! These are all really amazing tips and ways to share a cup with someone. Sometimes it is nice to know that there are people out there that care. Having family in the military, this was so touching. Just spending time together even if over a cup of coffee is so nice. I know that a good cup of coffee always gets the conversation flowing around here. This is such an awesome thing! I love your story, thank you for your service! And I love a good cup of coffee. Wow thank you for sharing with us your grandfather’s story. I’d love to do my share so I’ll be looking into Guardian Angels for Soldiers Pets. My grandfather was just like your father. He was so proud to serve our country and he too was in WW ll. 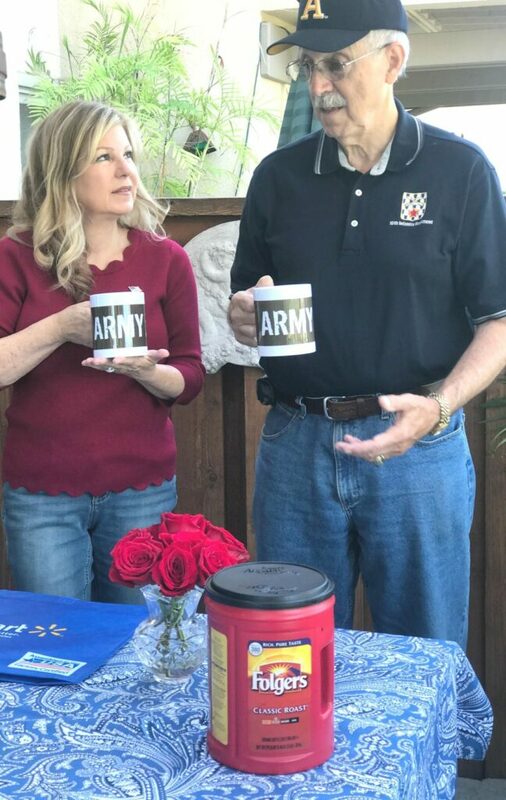 This campaign to invite a veteran to share a cup of coffee and a story with you is an amazing thing. I too served in the Army and Army Reserves. Thanks for sharing this wonderful campaign and your beautiful story. My dad was a lot like yours. He was a strong advocate of the USA. 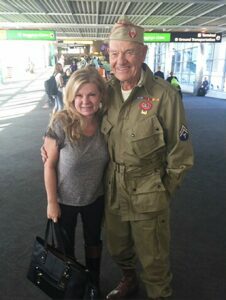 He served in Korea. My father in law served in Austria in WWII. My uncle was in Viet Nam. God bless all our armed services. Great post! I love finding other women bloggers that are also veterans so thank you YOUR service sister!